Because of a silver-colored horse named Concho and a notorious outlaw named Billy the Kid, my tether to the digital world got snapped. And, as it turned out, I was grateful. I’ll explain. It all started about a year ago, when I heard about an intriguing trail riding vacation called the Tunstall Ride. It had a Billy the Kid theme and was based in southern New Mexico, major Kid territory. According to Beth MacQuigg, the ride manager, there would be three days of trail riding and we’d be traveling over some of the same rangeland that the Kid would have ridden over. Riders would be housed in guest rooms on a private ranch adjacent to the property where the Kid once worked as a ranch hand. Known as the Tunstall Ranch, it was owned by his boss, Englishman John Henry Tunstall. Billy was riding with him one day when Tunstall was gunned down, was the first person to be murdered during the infamous Lincoln County War. That bloody conflict aside, the land we’d be riding over was reputed to be some of the Kid’s favorite country. Beth told me that most people would be bringing their own horses, but for those of us who were horseless, like me, rental horses could be provided. As someone who loves horses, trail riding, and Western lore, the Tunstall Ride sounded immensely appealing, and I signed up. I signed my husband up, too. Though Terry doesn’t ride, he could hang out at the ranch and join us for meals and explore the historic sites with us that we’d be visiting without the horses. In signing on, I anticipated some good times on horseback, but I what I hadn’t imagined was just how deeply it would immerse me in an authentic Old West experience. Not only would we be staying on a working cattle ranch (and most definitely NOT a dude ranch), but we’d often be riding where there were no trails – a wonderfully liberating experience -- and sometimes following paths made by the ranch’s special breed of cattle, the sleek black Brangus, a cross between Angus and Brahman. And we’d also be meeting real cowboys, like the ranch foreman, people who still used horses – not trucks! – for roundups and other ranch chores. The vast 14,500-acre ranch where the ride where was based is the country home of a Texas oilman, R.C. Bennett, a gentleman with deep Western roots and a good friend of Beth’s business partner. It was located approximately 50 miles down a paved road from the nearest town of any size, Artesia, New Mexico, and then about another 15 miles down a winding dirt road – and about a million miles from the modern world as I knew it. Just getting to the ranch proved to be a little more of an adventure than Terry and I had bargained for. The instructions on our map indicated that once we turned off the paved road, we’d be crossing two gravel riverbeds before we reached the ranch buildings. We expected them to be dry riverbeds. But instead, both were flowing with water and the banks were worrisomely muddy. We were not at all confident our Subaru could make it through. At the first of the crossings, we got out of the car to size up the best possible route. I tried to call ahead to the ranch to let them know we might be delayed. Sure, like cell phones would work way out here. The lack of cell phone reception was my first clue that over the course of our stay, I would be totally off the digital grid – no working cell phone, no Wi-Fi, no Internet. An interesting situation, given that I’m someone who makes my living working in digital media and is typically connected all day long to the Internet. Even last fall, while sailing down the Nile in Egypt, I was able to get online and use a computer. This would be the first time in probably a decade I’d be so disconnected from modern technology. But on the drive to the ranch, it was too soon to imagine what that might be like. Fortunately, our Subaru made it through the crossings just fine. By the time we reached the ranch, it was late afternoon and a convivial group was sitting under a wooden pavilion enjoying cocktails and getting acquainted with each other. There were 15 of us all together, 10 riders and 4 who were largely support staff, plus Terry. Most of our group was from the Southwest but one ardent horseman and lover of all things Western had come from faraway Denmark. 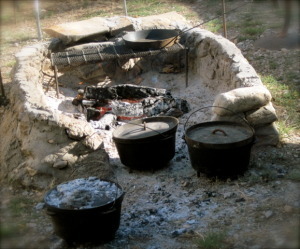 Click image for more photosOur dinner was cooking over a campfire nearby and featured dishes made in heavy cast iron pots known as Dutch ovens, a traditional Old West cooking technique and a staple of chuck wagon cuisine. Tending the pots was Wally Roberts, Beth’s business partner and a master of Dutch ovens. Wally and Beth welcomed us to the ranch, and Beth took me over to meet Concho, who would be my mount for the next three days. He was already saddled and waiting for me to try him out. As I took him for a little test ride out behind the pavilion, he seemed sweet, sturdy and good-natured, exactly as he proved to be on the trail. That first evening set a pattern we were to follow for the next three nights – a leisurely cocktail hour, dinner cooked over the coals, and lots of time before and after the meal to get to know everyone in the group. One evening, a quartet of local cowboy musicians stopped by and treated us to an alfresco concert of cowboy music under the starry skies. Bedtime tended to be early, since we needed to hit the trail early in the day to ride before it got too hot. Breakfast was around six am. At home I’d usually still be sleeping at that time, since typically I’d be up long past midnight, working on my laptop and catching up on email. That wasn’t an option here, of course. Not that I really missed the constant pressure of always staying connected. Being off the digital grid like this meant being able to savour pleasures that were all too rare at home. Long conversations, for one thing, and communicating face to face, not via emails or texting. 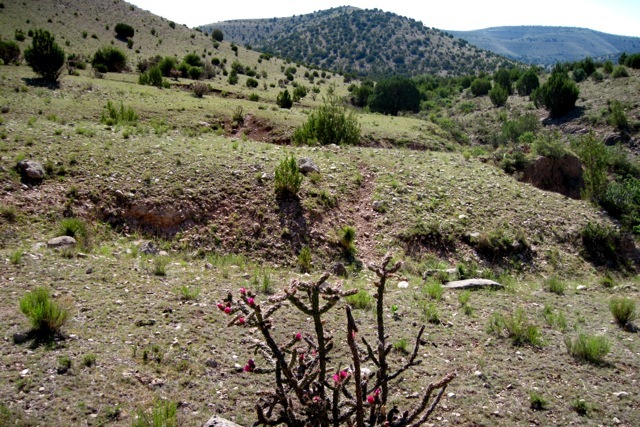 Enjoying the natural setting was another major plus – the stars at night and the varied scenery we rode through in the day, from gardens of candelabra-like cholla cactus lit up with vibrant red flowers to sweeping views of the ranch’s steep hills and deep canyons. Deer roamed just outside the ranch fences and once before dinner we had a chance to examine a huge moth, the size of a child’s hand. Eating, of course, was another primal pleasure, especially eating food that had been cooked in the most basic of ways, right over a fire. And there was plenty of time to explore, too. One afternoon, our host, Mr. Bennett, who was a wonderful storyteller, took us on a little Billy the Kid tour. We saw the ruins of the stone dugout where the Kid once lived with his fellow ranch hands, and the thick-walled home of his murdered boss, Mr. Tunstall. Though undoubtedly fine for its time, it had long been uncared for and had a substantial hole in the roof. One could stand in front of these structures and contemplate such eternal themes as the fragility of human artifacts and the inevitability of mortality. And being off the grid like this gave me the rare chance to enjoy the way the earth comes to life at sunrise, with the bird calls and objects like horses and trees taking shape in the growing light. But most wondrous of all was the quiet, especially at night. No traffic sounds, no blaring TVs, no police helicopters overhead. No, I didn’t mind being off the digital grid one bit. I truly enjoyed it. Thanks, Billy. And thanks, Concho. For more information on this ride and others that are part of The Billy the Kid Trail Ride Series, visit http://billythekidtrailrides.com/index. Carolyn Handler Miller (www.carolynmiller.com) is a writer who works across a variety of media. Originally beginning her career as a newspaper reporter and magazine journalist, Carolyn's work spans writing for TV, feature films, books and new media. She is one of the pioneering writers in the field of interactive narrative, where she has contributed to over four-dozen projects as a writer, writer-story designer, and consultant. She is the author of “Digital Storytelling: A Creator's Guide to Interactive Entertainment” (Focal Press), now in its second edition.